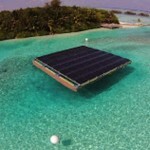 The Gili Lankanfushi plugged in the Maldives’ largest floating solar power platform today, enabling a reduction of its annual carbon footprint by 35 tonnes of CO2 emissions. The 15m by 15m platform is “an engineering marvel, an innovative floating structure that is designed to survive waves and water turbulence,” the resort said in a press release today. The reduction of the carbon footprint is meanwhile equivalent to 30 return flights from Europe to Maldives per person. Deborah Burn, marine biologist and environmental officer at the resort, told Minivan News that Swimsol financed the platform installation as a research project, but the resort plans to buy back the electricity supplied from the solar panels. Solar panel electricity systems, also known as solar photovoltaics (PV), capture the sun’s energy using photovoltaic cells, which does not need direct sunlight to work and is able to generate some electricity on a cloudy day. In January, Gili Lankanfushi earned the prestigious TripAdvisor Traveller’s Choice Award 2015 for Best Hotel in the World. The Maldives’ the Club Med Finolhu Villas, opened for business in January with 6,500 square meters of solar panels capable of producing 1100 Kilowatts at power peak.